SEO is used to improve the visibility of the websites and make them get a high rank on the search engines. However, all the campaigns may not always be enough to get the results that you want for your site. Even the best service providers may not be able to help you achieve the ultimate success. This may be because you had not considered your competitors and, therefore, had not analyzed their strategies and campaigns. You must always monitor your competitors and design your campaign in a way that is one step ahead of theirs. 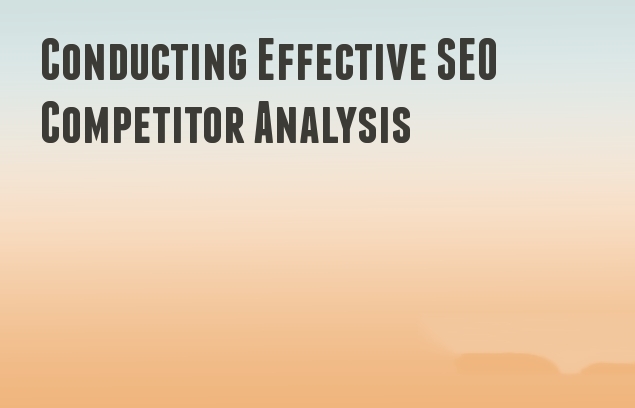 There are some steps that you can follow to perform the ultimate competitor analysis. Firstly, you need to find out about your competitors. If you belong to a niche market, it is easier to know about them. On the other hand, if you belong to big industry, it will take a bit of research to find out in detail about them all. You must at least check the top players in the industry and find out more about their SEO campaigns. You can find out the list of keywords that the customers use to search for the products and the brands in your industry. Keeping track of these things will help you formulate better camping for your business. Another way to understand your competitors and their campaigns better is to analyze their websites correctly. Find out how they use the keywords and how the content is placed and used in their site. Discover what copywriting techniques are being and how they are different than yours. Since you belong to the same industry, the keywords that your competitors use will be relevant to you too. You can use tools like Keyword analyzers to find out the keywords that will perform well for your site. This will help you find out figure out the best for your site and work on it. Backlinks are very important for a successful SEO campaign. You need to analyze your competitors’ websites for the number of backlinks they have been using. Also check for the unique domains, text links and find out how they are working out for your competitor. You also need to analyze the page ranking of your competitor’s web site in the different search engines like Google, Yahoo, and Bing. There are tools that will help you check the quality of the web site and an understanding of how you can make your web site better. Social media is a rapidly developing portal that will give a lot of exposure to your web site. You can use it to reach a lot of viewers and customers. Your competitors will also do the same to capture more potential customers. If you check their social media presence, you will get an idea about their success and their reach. This is another way to gain organic traffic to your web site. This is also quite an affordable way that can gain you a lot of viewers. How to measure SEO success? How to Write Striking SEO Content to Rank Higher in Google?